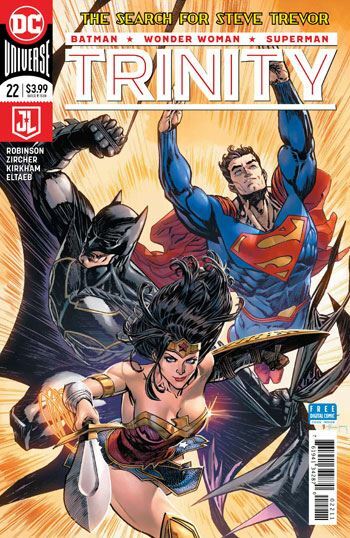 Trinity comes to an end with issue 22. So this Robinson and Zircher story has to be viewed both on its own merits, and as a conclusion to the run. It fares much better in the first instance than in the second. The Warlord story comes to an end here, pitting Superman, Batman, and Wonder Woman against Deimos. I have quit enjoyed this storyline, and the way it brought in the Skartarian characters bit by bit. First we got a re-introduction to the lost world of the inner Earth itself, then Jennifer Morgan, then the Warlord himself, and Deimos for the grand finale. This was very well laid out, and executed. Robinson clearly held affection for the old series, and Zircher excelled at bringing it all to life. This final issue is essentially one huge battle scene, but that’s fine. More than enough groundwork and characterization was laid along the way. The ending holds some nice twists, nothing ground breaking, but fully satisfying. Unfortunately, this also ends the book itself. And while this story is fun in and of itself, it’s not a story that brings the series to any sort of ending. The book just stops, as opposed to coming to a conclusion. That is not really the fault of the creative team, as much as of the editorial decision to bring an end to the book. True, it was never a must-read, as the three heroes all had their own books, which were the cores for any development of the characters. Overall, I enjoyed Trinity, though. It might have been nice to have had something change in their relationships to each other. Something that gave a reason for the series to end. 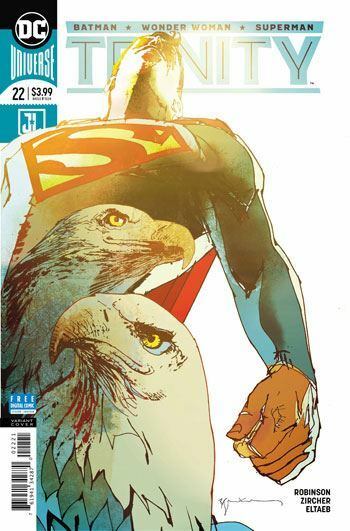 Still, I did enjoy this issue on its own merits.